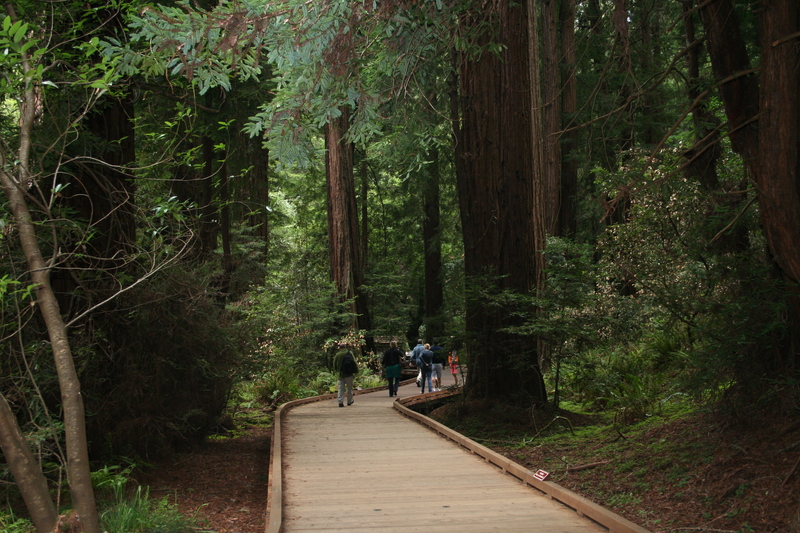 Muir Woods National Monument is a major tourist destination in the Bay Area with good reason. The majestic redwood trees are a wonder of Mother Nature as the only old-growth coastal redwood forest remaining in the Bay Area. 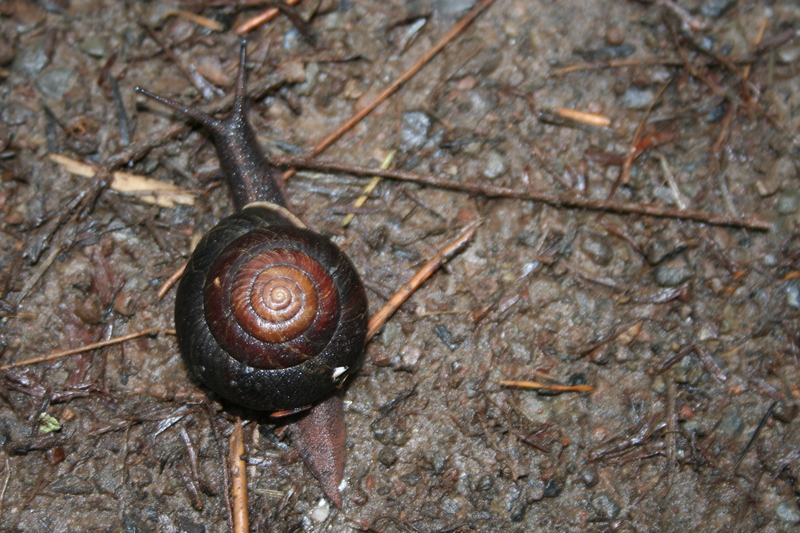 The gurgling Redwood Creek runs through a forest that is lush and green with ferns, banana slugs and snails. It can also be quite crowded, especially on weekends. This hike will take you through the heart of Muir Woods before veering sharply uphill and away from the crowds into Mt. Tamalpais State Park (aka Mt. Tam). You’ll climb more than 1,800 feet to be above the forest and even get a view of the Pacific Ocean before looping back to your starting point. It’s a tough hike with stairs and a short steep uphill climb, but it’s worth the work. And at only 4.5 miles (about 2-2.5 hours) it’s a manageable day hike even if you get off to a later start. GPS Track: Download the GPX file. Note: This includes a detour at the end along Deer Park Fire Road because a bridge on the Dipsea Trail was closed. 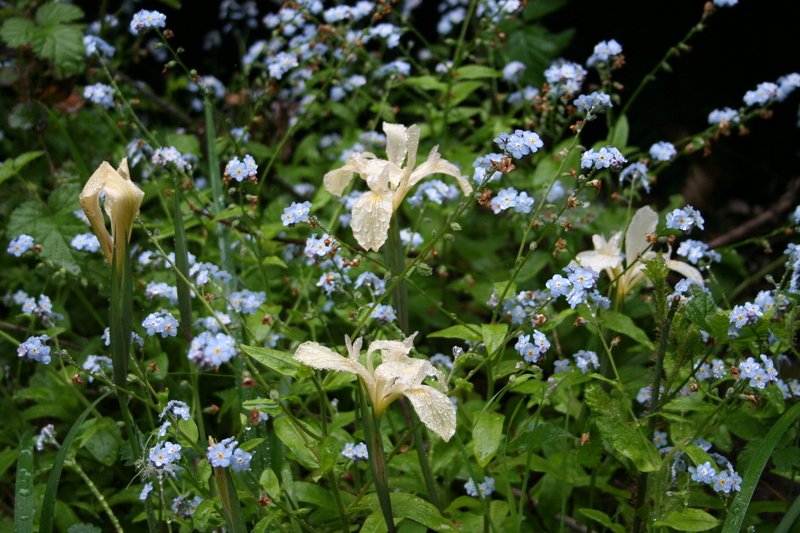 If open, continuing on Dipsea will return you to the parking lot as well. 1. 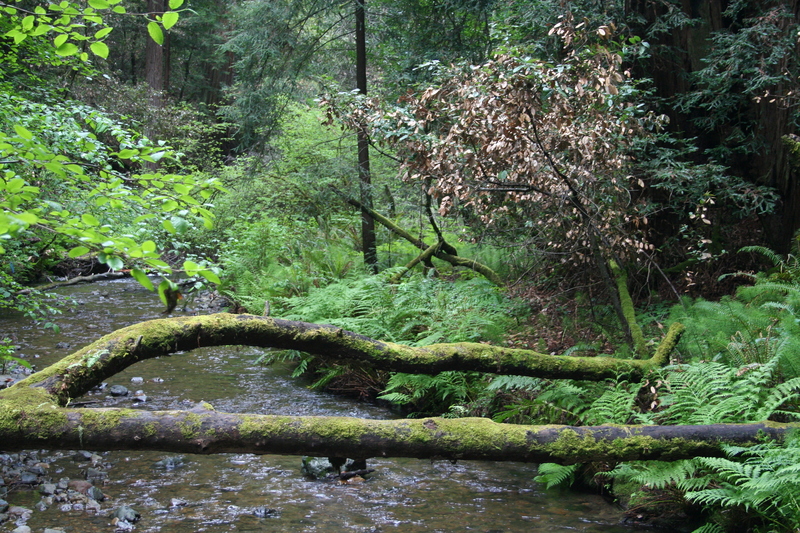 Park in the overflow lot and follow the signs at the northwest corner to Muir Woods. 2. Stop at the restroom as you pass – this is the only bathroom along the trail. 3. Pay your entrance fee ($7 currently); if you are a lover of the park system, drop a few extra bucks in the donation box to support our parks. 4. Enter the park and follow the Main Trail. Though it’s not labelled as such, it’s the only trail heading into the park under the big Muir Woods arched sign. 5. You will pass several numbered bridges on your left. Just stick with the well maintained main route. There are plenty of signs about redwoods to read along the first mile, in a few places the main trail splits so there’s a left and right option around some trees, but both paths always meet back together on the other side. Be courteous and quiet and as you pass through the Cathedral Grove. 6. Stay to the left as several trails (Fern Creek and Camp Eastwood) veer to the right. Just past the Camp Eastwood Trail will be Bridge 4, which you will want to cross and make a right on the Ben Johnson Trail. This is where the ascent begins. 7. As you near the top of the ridge line after tough 1.1 mile climb, follow the sign for Ben Johnson to Dipsea Trail, making a left turn. 8. After a short little jog, you will come to the only potentially confusing three-way intersection on the route. 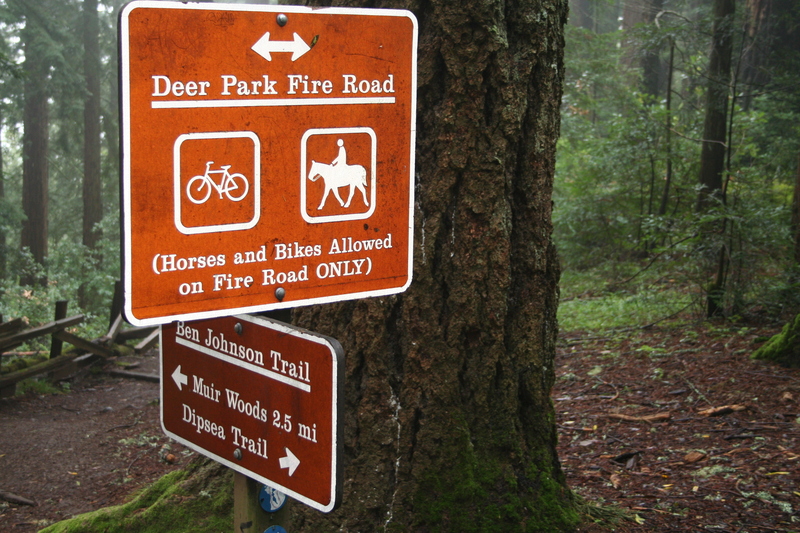 Follow the sign for the Dipsea Trail crossing over the wide dirt Deer Park Fire Road. 9. Follow the Dipsea Trail signs. 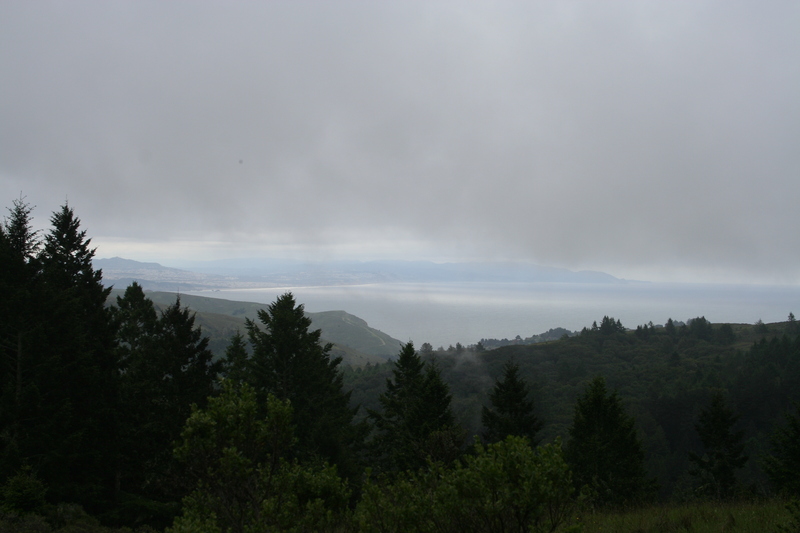 You will briefly be on the Deer Park Fire Road and the Bay Area Loop Trail. When an arrow simply says “Trail” with no name, follow it. 10. 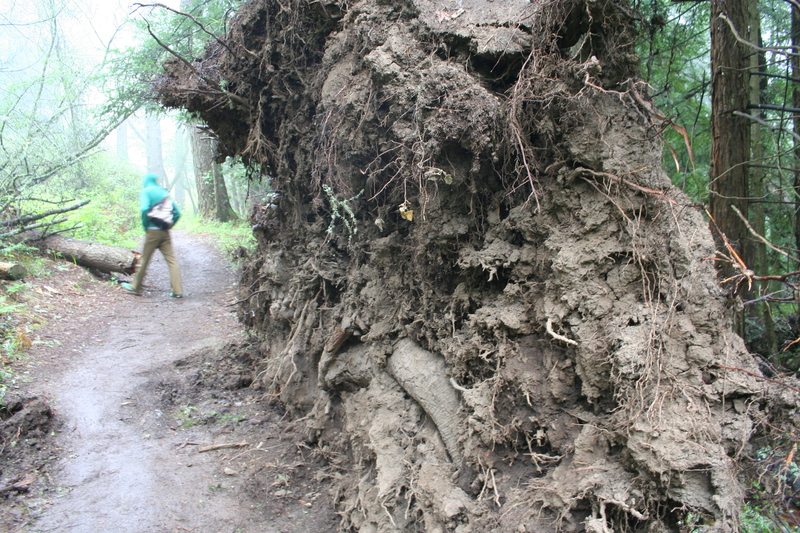 The Dipsea Trail will lead you right back where you started in the overflow parking lot. On the day we went, the Dipsea Bridge was out near the end of the trail, so we followed the Deer Park Fire Road until we hit the road just beyond our parking lot, making a left we followed the road (avoiding many tight car passings) back to the lot. I wouldn’t recommend this route, unless you are forced to take it because of the bridge closure. The Dipsea is more scenic and has no road hazards. While I listed this as moderate, you will climb about 1700 feet in 1.1 miles with a fair number of stairs, so if steep climbs are your nemesis, you may consider this more strenuous. Don’t be fooled by the main trail at the beginning of this hike, where it’s relatively level pavement or boardwalk and tourists in high heels and all levels of fitness meander through the redwoods. The terrain as you leave the main trail can be quite muddy and slippery. 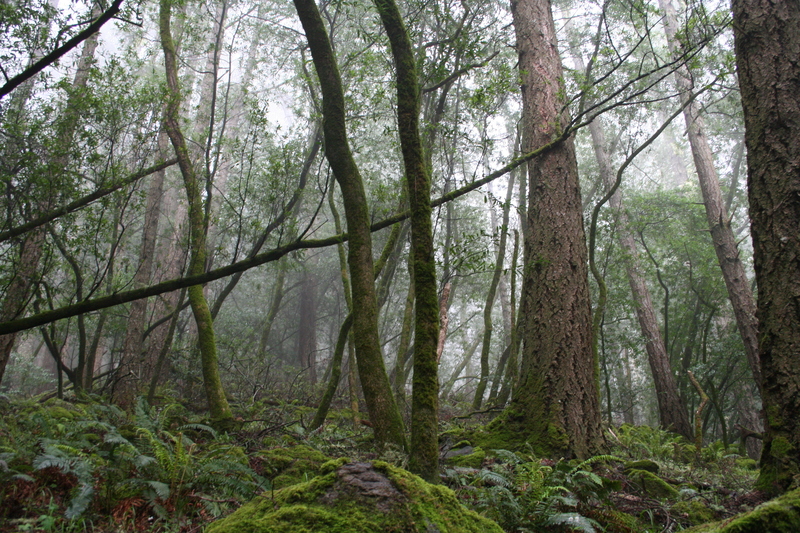 It’s almost always moist in the redwoods from fog condensing and dripping down from the trees. One of the hikers on the day we went had a spill coming downhill back to the parking lot, so be sure to wear good hiking shoes and pants you don’t mind getting a little mud-soaked on the cuffs. While getting lost is very unlikely as the park and trails are exceptionally well-marked, be sure to have a map with you that shows alternate routes (like this one). There are often unexpected trail closures because of washouts or fallen trees and having a good map will help you find an alternate path if needed. You can get driving directions from Google Maps which properly places Muir Woods National Monument. I prefer parking in the overflow lot, just past the main entrance if you are coming up from Highway 1. By starting here, you will walk past a restroom (with flushies) for a pre-hike pitstop; you’ll also be perfectly positioned for exiting from the Dipsea Trail at the end of the hike.